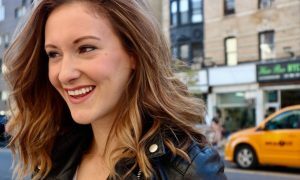 Melinda Sullivan (USA) will headline the 2018 Australian Tap Dance Festival. Photo courtesy of ATDF. The 7th Annual Australian Tap Dance Festival will soon take centre stage in Melbourne, running 29 September – 6 October with a world-class lineup of talented tappers arriving for Australia’s premier celebration of tap. Would you like to win tickets to the Play The Floor Tap Gala on 6 October? How about a $50 Capezio voucher or a Capezio duffle bag? See how to enter these fun giveaways below! 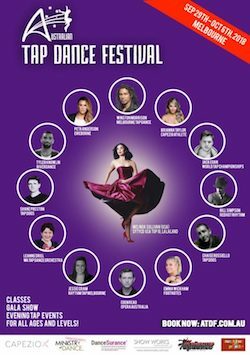 The Australian Tap Dance Festival is the only festival of its kind in Australasia and offers an action-packed week of tap and choreography, lessons and master classes, dance battles, seminars, a Gala show and special events for all ages and levels. 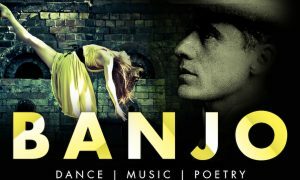 The festival will take place at Melbourne’s Ministry of Dance, a full accredited dance and training studio founded by renowned Australian dancer, choreographer, performer and presenter Jason Coleman. 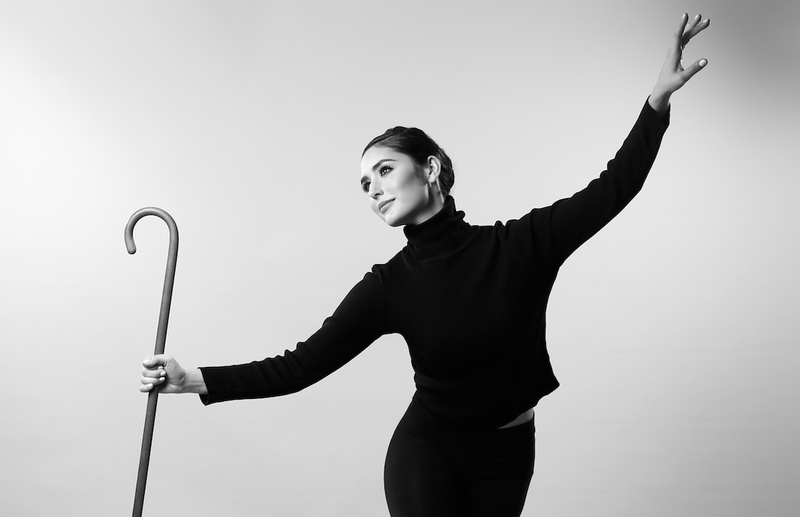 This year’s Festival faculty features an exceptional roster of accomplished tap artists, including American headliner Melinda Sullivan – one of the most sought-after tap soloists and choreographers in the world (The Late Late Show with James Corden, La La Land, SYTYCD USA). Other esteemed faculty include Winston Morrison (Festival director and founder of Melbourne Tap Dance), Tyler Knowlin (currently touring with Riverdance), Peta Anderson (currently touring with Eireborne), Bill Simpson (founder of Red Hot Rhythm and choreographer of Strictly Gershwin), Brianna Taylor (one of the first female Australian tap dancers to perform on Broadway in Untapped USA and currently touring with Nick Young’s tap company in L.A.), Shane Preston (Tap Dogs), Luke Alleva (London West End performances, The Dancin’ Man), Jack Egan (The Forge Tap Project), Eden Read (Opera Australia, The Space Dance & Arts Centre), Leanne Driel (WA Tap Orchestra), Jessie Cram (Rhythm Tap Melbourne) and Emma Wickham (creator of Footnotes Tap troupe). 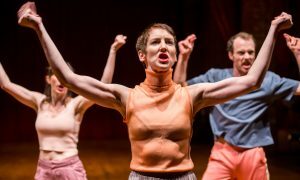 Each carefully selected faculty member will also be offering special five-day residencies teaching full performance routines from October 2-6. 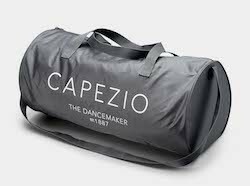 You could win this Capezio Duffle Bag! This year’s programming includes Never Tapped Before, a free beginners class open to the public; a History of Tap Lecture; a Talking Tap Faculty Q&A; a Cutting Competition Dance Battle; the inaugural Tap Trivia Night; and the penultimate event, Play The Floor, the official Festival Gala showcasing the superb skills of the highest caliber Australian and international tap dancers. Festival Sponsor Capezio will also present an artist showcase entitled Future of Tap on Monday, October 1 at 6:30 p.m. in the Ministry of Dance Theatre. Three winners will be chosen as “Faculty Choice” (awarding a $500 voucher), “Audience Choice” (awarding a $300 voucher) and “Emerging Artist“ (awarding a pair of K360’s or a $250 voucher if two or more persons are in the winning act). To register, head to www.surveymonkey.com/r/J3BTB3M. To enter to win a double pass to attend Play The Floor Tap Gala on Saturday 6 October at the Lauriston Girls’ School in Armadale, email info@danceinforma.com with the answer to this question: What country does tap dancer Melinda Sullivan call home? Title your email entry “AUS Tap Festival Giveaway” and include your full name, age and mailing address. This competition opens September 26 and closes October 3, 2018. To enter to win a $50 Capezio voucher or a Capezio duffle bag, email info@danceinforma.com with the answer to this question: What is the name of the Festival director? Title your email entry “Capezio Goodies Giveaway” and include your full name, age and mailing address. This competition opens September 26 and closes October 3, 2018. For more information on the Festival, visit australiantapdancefestival.com.au. Les Ballets Eloelle’s ‘Men in Pink Tights’: Who said ballet was a drag?